5 Ways a Ductless AC Can Benefit a Home | Balanced Air, Inc.
Fall is a good time to make plans for the future of your air conditioning system. When the most intense heat of the summer season eases up, you won’t need the AC running on a regular basis. This makes it easier to schedule a big job like replacing the system—or putting in an entirely new kind of cooling system. That’s what we want to talk to you about today: changing from an old AC central system—or possibly just a bunch of window units—to a ductless mini split system. 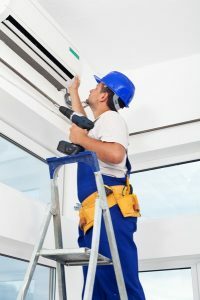 A ductless AC works through a series of wall-mounted air handlers placed in rooms around the house, each which connects to a single outdoor unit. A ductless mini split is a type of heat pump. (There are some “cooling only” units, but most are heat pumps.) This means you can enjoy air conditioning ­and heating in a single system. It only takes an adjustment to one of the units to turn on the heating power. Heat pumps are effective and energy saving in our climate, so if you are also thinking about replacing your old electric furnace this year, a ductless mini split heat pump is a terrific choice. Ductless cooling systems usually cost less to operate than central systems. There are two basic reasons for this. First, the lack of ducts means there’s no heat gain along the duct walls to warm up the cooled air on its way to the rooms. Second, the motors in ductless mini splits are smaller than the motors in a central system, and they draw on less electricity. Each of the air handlers in a ductless mini split system can be adjusted and turned on and off separate from the other units through its own remote control. This means the ductless system only has to cool down (or heat) the rooms that need it. It’s instant zone control, without requiring any other installations, and you’ll save even more money. If you don’t have a central AC at all because your home doesn’t have space for ducts, then the ductless system is the alternative to ugly and inconvenient window ACs. Going ductless is also great for new construction, since the space-consuming ducts can be left out entirely. To arrange for ductless air conditioning services in Clearwater, FL, speak to a member of our team. Experience Comfort when you work with Balanced Air, Inc. We’ve served the Tampa Bay area since 1988.